Some websites I helped develop. 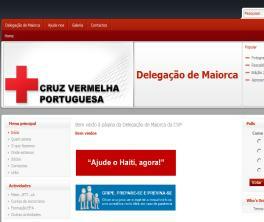 Evolution of the previous website of the Portuguese Red-Cross delegation of my parent's village. The new website is built with Joomla which is a very powerful and easy to use Content Management System with a lot of extensions available. Fresh start for a website of Casa do Povo de Maiorca. Casa do Povo is an institution in Maiorca, Figueira da Foz, Portugal that promotes social cultural events and has many activities and cultural groups..